Grate staff, recepcion was so warm and gentle. Great hostel with a perfect location between the main city's monuments and attractions. The staff is helpful, kind and professional. 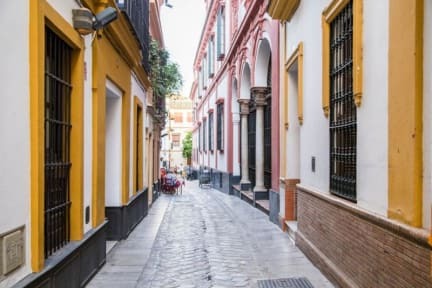 Besides that, the hostel's activities are well balanced starting with the walking tours for those pursuing to discover Sevilla, then tapa tour to eat local Spanish cuisine, free (delicious) dinners made by the staff and finally the night tour for those "thirsty" late at night. Do not miss the terrace with its unique atmosphere. Best hostel I've stayed so far in my life ! Everyone in the staff is so nice and create a family vibe to the place! Thanks Julian , Davi and Alan for the amazing reception there! I'll Be back for sure! Hostel sensacional! Staff muito simpático e solícito. Localização perfeita, lugar muito limpo, bem cuidado. Excelente atmosfera! Um dos melhores hostels em que já me hospedei (e já fiquei em muitos!). Só tirei um ponto das instalações porque o ar condicionado do quarto era desligado pela manhã e fazia calor. Mas o hostel é sensacional, como todos da rede Hostel One. Equipe maravilhosa, disponível e atenciosa. Agradecimentos especiais ao Davi, Maggalena e Aly. Obrigado pela acolhida e por tornar Sevilla inesquecível, pessoal. Hemos pasados un buen día en hostel one catedral. Todo estaba muy limpio, y de verdad es muy cerca de todo! Recomendolo a todos!